Huawei isn’t a public company, but it does release financial reports that are audited by KPMG. 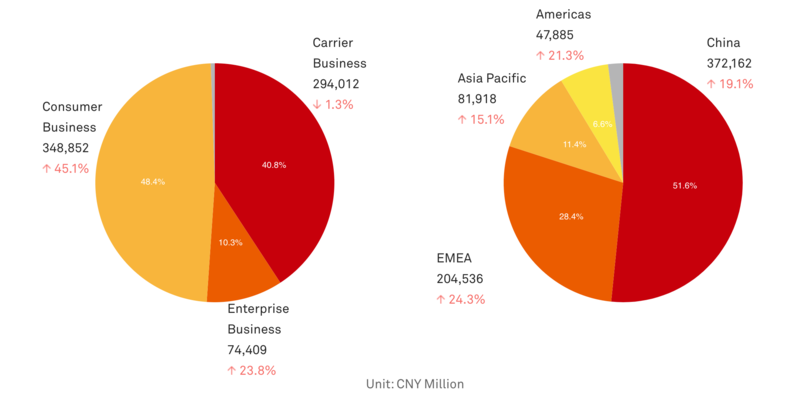 The big takeaway from its latest financials is that it has become a hardware company — that’s to say that revenue from consumer devices overtook Huawei’s core telecom business, which involves selling networking gear to carriers. The company is, unsurprisingly, still reliant on China, which accounted for 52 percent of its revenue in 2018, although Huawei saw stronger growth from other global markets. Its business in the Americas, however, lags that of Europe and the Middle East and Asia Pacific in terms of revenue, and that isn’t likely to change soon. The Chinese company has fought back against a ban on its equipment in the U.S. through a lawsuit arguing that federal agencies and contractors have violated due process and acted in a way that is unconstitutional. Still, the U.S. concern around national security has been fortified by a U.K. government report released this week, which claimed there are “significant technical issues” around adopting its telecom network kit.